A very popular manual for troops during the war; demonstrates formations, wheeling-reforming, and general rules of engagement. This from "Bureau of Navigation-Navy Dept." Some penciled notes. Good shape. Spine tight. Within the pages of this children's book was hidden an original 1862 $100 Confederate note! This edition of "Willy and His Dogs" was released by the American Baptist Publication Society in Philadelphia during the Civil War period. One is surely left to wonder why, how, and who? Missing 9th Georgia Soldier's envelope: Gettysburg!!! 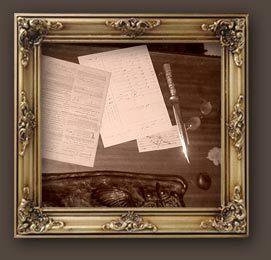 From a ledger page of items collected off the Gettysburg battlefield by a Mr. Bellows, a local souvenir hunter: Scouring battlefields immediately after a clash were popular pastimes during the CW, driven by both pure curiosity and sometimes financial motives. This plain envelope, 5" x 3", is marked "Paid 10" and postmarked "Apr. 18....CELLO" I am not sure if that is Monticello or there were other Southern towns with that ending. In any case, it is address to Mr. L. J. Copeland, Richmond, Va. Co. H "9" Regt. Geo. Vols. Archives indicate that Lucius J. Copeland came from Brooks County, GA, enlisting on 6/6/61 as a Private in Co "H" Ga. 9th Infantry, which lost heavily at Gettysburg and thereafter decimated in many battles. No further records of Copeland exist after Gettysburg, so we are unsure of his ultimate fate in those days. Did he die at that conflict or go A.W.O.L.??? A farmers Almanac for 1862 published by Breed, Butler & Co. in Buffalo. Tells about the predicted daily weather, the phases of the moon, and even the governing of the human body by the celestial constellations. Has a section of wise sayings and short stories of wry humor. Also, it has ads for current books and cure-all Medicinal products in the back. The ad for the Niagra Railroad Company shows commuters going to work in trolley cars pulled along by white horses! Small pocket-sized books of philosophy or wisdom called tracts were popular reading and often presented as gifts to family/friends prior-to and during the Civil War. Such philosophy was often carried to war and read in camp at night, particularly during period of long winter inactivity. These small books traveled easily from home in a trunk, backpack or being delivered by wagon later as presents. People at home often sent "care packages" by Express Services, containing jarred foods, dried meats, beverages, stamps, writing paper, socks, scarves, soaps and yes, even books. This is a compilation of poetry edited by J.M. Fletcher and published out of Boston in 1848. It is pencil-inscribed "To Charlie, A New Years Gift from his teacher...January 1860." Tucked in between some pages were bunches of cotton thread, leafs of clover and a small lithograph of a boat, possibly to mark important pages or refer to the readings. Very neat to see the thoughful side of citizen-soldiers at this time. 4 1/2" by 3". Pages: 128. Embossed dewsign on red cover with gold highlight to cover and spine. I believe that St. John's Guild is an old English Charity branch of one of the English Protestant Churches. It now seems to care mostly for the blind... Here is an engraving of a Civil War Hospital ship. It flies the flags of "St. John's Guild;" the Union flag; and I think the New York State flag. In nice condition. Image is 4 1/2" by 7", and overall page is: 7" x 10". This is a military book from 1862 focused on bayonet techniques written by George McClellan. It is inscribed by Lieutenant Foster Wood, Co.I of the 86th N.Y. Volunteers upon its front leaf. Also, on book's edges are written: "Co.E.","Co.E." and "Co.E. 86 N.Y." Perhaps this was the property of Company E either before or after it came into the possession of Lt. Wood who was with Company I. Many young officers kept such manuals with them for reference during the Civil War. This is a Wonderful Book that Documents Five Months of records for the: Thompson Independent Rifle Company raised in June 1863 to counter the Confederate push into Pennsylvania. Of course the Rebels were reeking havoc and alarm in south central Pennsylvania, trying to grab Harrisburg and train lines in order to force a Union armistice. So, hasty volunteer compaines were raised. This being one of them. William F. Rich was Captain. He enlisted on 6/29/1863 and was commissioned into "Rich's Company" of PA. Dept. Corps. Infantry. Although the CW Database says he mustered out on 7/8/1863, he is still listed as The Captain of this company through October 1863 when the reports ceased in this book. Also noted is thar C. Burchfield was Sergeant. There were 3 Officers listed in these reports and either 97 or 98 Enlisted Men. The company's Station (location) around the week of Gettysburg Battle is interesting to see written: July 1,2,3 they were in Philadelphia. By July 4th,1863 they were transported to "Camp Dana Curtin, Harrisburg, PA. Then, back to West Philadelphia by July 9th (since the Battle of Gettysburg had been won and the Confederates were retreating through Maryland southward.) An interesting notation tells how they were ordered "to proceed to West Philadelphia. That (we) were relieved from duty in the field to resume duty as Employees of Penna Rail Road Company for the present. That (they) still maintain organized drill weekly and be in readiness to march at an hour's notice." In September, an entry states "Private William Burr arrested by Order of Provost Marshall for dissertion." When mustered out Nov. 2, still under arrest with his Division. After October, the reports stop. The Company's enlistment period had expired and no current threat by Confederates to State of Pennsylvania then existed. There are about thirty blank Morning Report pages following in this book. Unclear when it was bound, but their is a bookplate in front "McLaughlin Brothers, Book and Job Printing; Binding, Ruling and Stationary; 112 & 114 South Third Street, Philadelphia." The spine of the book is broken. Pages are almost free from spine but they are in very nice preserved condition. The leather front & back covers are very good. So this book simply needs to be rebound along its spine someday. An awesome piece of history that ties right into the Emergency Troop Call-Up that was enacted to counter the 1863 Confederate Incursion into Pennsylvania which in essence led to the famed Battle at Gettysburg! Size: A big 15" by 11". This is a box of papers that recounts an amazing American Family's history from the 1600's in Massachusetts through the 1950's. First, we learn of a famous ancestor, Hannah Emerson Dustin who scalped 10 Indians in revenge for the killing of her baby (1697). The family was rich in both soldiers and statesmen. It spawned an original Ohio Supreme Court justice, doctors, and a prominent lawyer in its ranks. The German side of this clan arrived in New York and lived in the notorious "Five Points" section of NYC (see movie The Gangs of New York!) They went into the Civil War. One soldier had his foot blown off at Antietam, another was washed overboard from a troop ship! Most famed was colonial soldier Tristan Coffin who fought in Revolution. Besides the Osbornes fighting in the Civil War, there was physician John W. Coffin serving in The Phillipines during Spanish American War! Books and pamphlets have been written on the Coffin Family. They belonged to DAR and Colonial Settlers organizations. These papers likely came from the Graff descendants in Pittsburgh, PA. It is now being researched by an dedicated author of historical and Civil War books. This is a very nice original 1861 Manual of Infantry Tactics book. In front leaf it has the ink name of soldier inscribed: R.L. Harvey, Jr. with Camp Hamilton location. Harvey (Rufus L.) who signed the manual served with the 20th Indiana Infantry and was discharged in Dec. 1862 due to ill health. The 20th was stationed at Camp Hamilton near Fort Monroe during Feb. 1862. However, after being discharged for illness in Dec. 1862 he recovered and on April 13, 1863, reenlisted in Co. "G" 63rd Indiana Infantry and served until he was discharged in 1865. This book has a nice cover and tight binding. Minimal foxing. Also, has fold out tactics and formations pages. This is a 3 inch by 5 1/2 inch pocket journal identified to corporal James E. Williamson of Co K, in the 36th Indiana Infantry. Nearly all the entries or notations are for 1864. Written in mostly pencil and some ink, the little testament is sparsely filled in with money amounts, money borrowed and paid, peoples names and addresses(in fact, our lead-photo shows his notation about a different trooper); and about four full pages of military notations on a day to day basis. The 36th was a Western theater regiment and saw a lot of action in Tennessee and Georgia in 1863 and 1864, including Shiloh, Stones River, Chickamauga, Atlanta campaigns. I do see a notation that reads; "Went to hospital with the smallpox on Saturday , 2nd day of April, 1864." From this announcement I assume the other entries are for dates before 2, April, 1864. Some military text includes: "Left Fayette on the 3rd and marched to Blakes(?) 4th marched 18 miles-5th marched at camp creek. 18 miles. 6th camped at Princton. 7th marched to Rocky Gap(sic) 8th camped at Giles Road? 9th fought and whipped the Rebs at Cloyd Mountain and camped at Doublin. 10th burned the bridge over new river & camped at ferry over new river." He includes "bushwackers fired on our column 21 miles to Lewisburg, boys very hungry.......15th camped two miles north ward of Union. Company D went foraging. Regiment without food. 16th camped at south side Freen Briar River. 17th encamped on North side of Green Briar River. Ferried troops and artillery all night. 18th encamped at Whit Church. Found flour in hay stack(hidden from Yankees) 19th camped at Meadows Bluff . 20th drew crackers. starved from the 20th to 26th army in a bad condition, no meat, no coffee, no sugar. half rations of hard tack." On "May 31st marched to Bungers Mills 13 miles. June 1st marched 12 miles encamped 3 miles from White Sulphur Springs. June the 6th. upended the railroad and burned it. several men hurt in operation myself included. 16th. hurt by R.R. (dropped rail tie?) falling on me." His next entry is 23 June 1864 "52nd Penn regiment rob(b)ed a union widow woman."... "six pieces of artillery captured Bufords Gap".... arrived at sweet Sulphur Springs on the 23rd / 1864. Last meaningful entry happens on 23rd of June: "60 wagons burned and a general destruction of property. One hundred head of horses captured." There are other hit and miss entries but records show that Williamson was discharged from service September 21, 1864. Wear to leather cover, and binding still partially intact. About 60 gold-edged pages, not all used. This is an original Newark, New Jersey newspaper from December 23 rd, 1862 "The Sentinel of Freedom". It discusses the action of New Jersey troops at the severe Battle at Fredericksburg and lists those wounded. A true connection in "real time" to a famous battle. This is a very nice example of the rare Confederate-used threadless "Egg Insulator". Often found in broken fragments, this reveals the shape well. The central shaft is smooth for placement on wood support, but not threaded like later insulators to stay put. These are much sought-after by Civil War and Insulator Collectors alike. This is an educational photo and item is not available for sale. This is a quite dramatic Union Patriotic letter envelop showing a pitched battle from the water to the land. Great graphics.